Rachael Kha (left) and Linh La (right) pose for a photo in the Loving Hut Tempe location on Friday, April 7, 2017. La and her family own and manage two Loving Hut locations, and Kha works as head server and cashier at the Tempe location. The growth of the Loving Hut vegan restaurant chain exemplifies the trend toward vegan and vegetarian diets. Many ASU students are taking advantage of the plethora of vegan options available at the chain’s Tempe location on University Drive, just minutes away from ASU’s main campus. A report released by Pew Research Center in November found that 12 percent of American adults between the ages of 18 and 49 said they followed a strict or “mostly” vegetarian or vegan diet. Alternative protein sources could claim as much as one-third of total protein consumption by 2054, according to Lux Research. The food production industry is taking note. The dairy alternative market is slated to reach a total of $19.5 billion globally by 2020, according to a report from market research firm MarketsandMarkets. “We’re very blessed that we’re getting busier and busier every year,” said Linh La, owner and operator of Loving Hut locations in Tempe and Glendale. An ASU alumna, La graduated in 2005 with a degree in strategic visual communication. She worked in a design firm for two years before joining the Loving Hut chain alongside her mother, who opened the Glendale location in 2009. La said that the quality of American food has greatly decreased with the rise of fast food franchises such as McDonald’s and Jack in the Box. "A lot of the food is turning to crap, and we want to do whole food," La said. 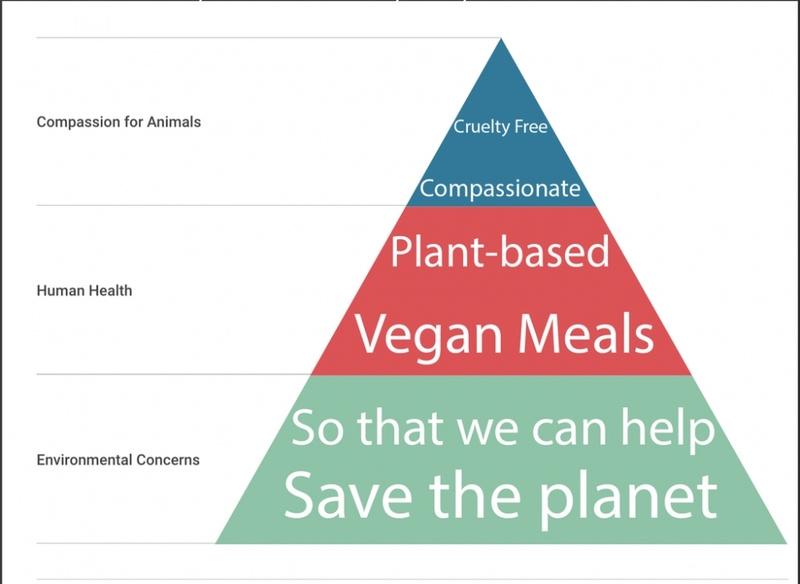 According to La, Loving Hut believes a vegan diet can address three areas: environmental concerns, human health and compassion for animals. The three principles of Loving Hut. Created by David Marino. According to La, Hai began her spiritual journey as a monk in the Himalaya Mountains before realizing that enlightenment could be achieved through other means. “Every single Loving Hut has a different menu, different chef, local supply (and) local demand,” La said. There are four locations in Arizona: two owned by La’s family, as well as locations in Litchfield Park and Phoenix. Rachael Kha is the head server and cashier at the Tempe Loving Hut. She is currently a senior in high school, and she said many of her classmates are opting for meat-free diets. "I noticed that veganism and vegetarianism are becoming really popular. It's becoming really trendy to do, actually,” Kha said. Kha estimated that one third of Loving Hut Tempe’s customers are ASU students. One recent ASU alum, Tommy Verderame, said he enjoys eating at Loving Hut even though he is neither vegetarian nor vegan. "What Loving Hut has to offer is a delicious way to eat healthy, which is why I like going there over McDonald's or Burger King," he said. Verderame graduated in 2015 with a degree in sustainability, and he said that's part of the reason he supports meatless alternatives. "When you look at a place like Loving Hut, to be able to put flavor in food that has an environmental benefit, it’s a pretty cool combination," he said. Reach the reporters at marinodavidjr@gmail.com and skylar.mason@asu.edu or follow @Marinodavidjr and @skylarmason42 on Twitter.